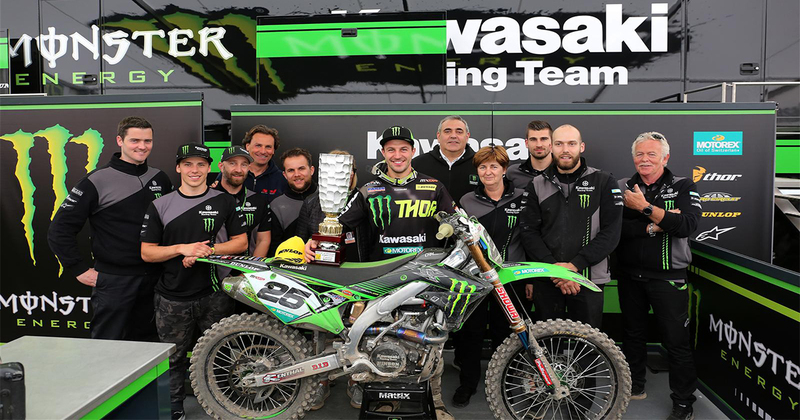 Clement Desalle of the Monster Energy Kawasaki Racing Team reinforced his challenge in the FIM World MXGP Motocross Championship with a stunning second place at the GP of Trentino in northern Italy. The Belgian rider and the hard-working KRT staff had already indicated the benefits of recent testing as he earnt third choice of gate in qualification and the upward curve continued on race day as he quickly took over second place in the opening GP moto. Setting the fastest lap of the race, he kept the pressure on the leader for half the moto to eventually finish just five seconds back at the chequered flag. Edged out of third through the first few turns of race two, Clement needed six laps to take over third place but the two leaders had already escaped out of reach. However third in the moto was sufficient to secure second place overall on the day and see him move significantly clear of his rivals for third in the series in addition to pulling back four points on the rider who is second in the standings. KRT teammate Julien Lieber recorded another solid top ten finish as he crossed the line ninth in race one, but an incident at the start of race two left him outside the points-scoring positions initially before a strong charge took him back to fifteenth at the chequered flag. The tremendous effort was sufficient to maintain his top ten series ranking. Maxime Desprey of Gebben Van Venrooy Kawasaki Racing again put in two strong rides to finish tenth overall from twelfth and eleventh moto scorelines and his Italian teammate Alessandro Lupino made it four Kawasaki’s in the first thirteen overall from fourteenth and thirteenth placed finishes.